as one of he Best Family Resorts in Michigan!!! - Detroit News 2003 Michigan's Best's issued in April. Halfway Lake Resort, a bit of Heaven in the Upper Peninsula of Michigan, offers you quality accommodations in a secluded woodland setting. Halfway Lake Resort has 8 new housekeeping cabins surrounded by 400 acres of hardwood and pine forest encompassing a 65 acre privately owned spring-fed lake. Food, gas and groceries within 1 mile. If you're looking for fishing, canoeing, hunting, swimming, boating, hiking, birdwatching, snowmobiling or cross country skiing, you will find it at Halfway Lake Resort. Fishing: This is an angler's Paradise, with some of the finest fishing in the eastern Upper Peninsula. Whether you're an angler or just love the smell of clear spring water, our 65 acre lake will catch your heart while you catch some of the finest trophy or pan fish with no license required. Spring and Fall fishing is outstanding. Boats and canoes provided, or bring your own. Many inland lakes are located nearby with walleye, northern pike, perch, bass and panfish or fish our rivers and streams for rainbow and brook trout. This is a major trout fishing area. We are 10 miles from the Two Hearted River, if you're looking for a blue-ribbon trout stream. We are also 10 miles from the Tahquamenon River, for great fishing. The famous Fox River is also nearby. Canoe rental available for all 3 rivers.. Hunting: Hunters staying at Halfway Lake Resort may hunt in our private 440 acre forest. Hunt waterfowl from the blinds within our forest. Bird hunting is superb. Deer hunting is also excellent in our forest and in the thousands of acres of neighboring State Forests. Bow hunting accounts for many trophy deer. Birding: Nesting Sand Hill Cranes may be seen near Halfway Lake, also Loons, Eagles and Osprey. Halfway Lake Resort is an excellent spot for bird watchers looking for some of our more elusive birds. The spring migration from the south to Canada goes right over Halfway Lake, so plan to stay here for this. Snowmobiling: We have "Lake Effect Snow" in this area of the Upper Peninsula. Snowmobile from your door to Lake Superior, Whitefish Point Lighthouse, Tahquamenon Falls and Pictured Rocks. Snowmobile rental nearby. 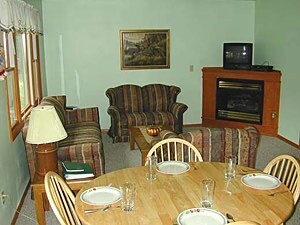 Halfway Lake Resort offers daily rates for snowmobilers. Agate Hunting: We are a short drive from the shores of Lake Superior. This stretch of the shore is a prime agate area. Agate hunting is at its absolute best in the spring after the ice floes have brought a new supply to the shore. Fall agate hunting is also very good, especially after a storm. Banded agates can be found only in the Eastern U.P., especially on the beaches between Whitefish Point and Grand Marais. Halfway Lake Resort is located in the middle of the banded agate territory. Our 8 modern cabins include a full kitchen with coffee maker, TV, bed linens and a charcoal grill. There is a community fire pit for evening campfires, a picnic area, swedish sauna, horseshoe pit, basketball court, plus boats and canoes for your use. Halfway Lake Resort is 12 miles north of Newberry, on County Road 407, just a few miles south of Deer Park. Four miles north of Newberry turn left at Four-Mile Corner. Go North to Halfway Lake Resort. We are 12 miles south of Lake Superior. Area attractions include Oswalds Bears; Grand Marais; Whitefish Point Lighthouse; Great Lakes Shipwreck Museum; Seney National Wildlife Refuge; Tahquamenon Falls; Big Springs; Pictured Rocks; Fayette Historical Town Site; AuSable Lighthouse; Canoe Livery for the Tahquamenon River; Soo Locks; and Mackinac Island.